From the To field, enter a 10-digit mobile number. As the number is entered, a matching contact may appear and can be selected at any time. 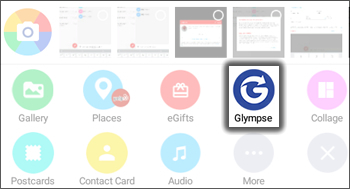 From the attachment section located below the message box, tap Glympse. For further assistance see, Set Up Glympse. If prompted with the Glympse disclaimer, tap Accept. Select a share location time option (e.g., 15 min, 30 min, 2 hrs, etc.). Tap Add Destination and enter destination (if desired). For additional attachment options, refer to Send a Message (begin with step 5).